Group of grapes is 12. (5 + 7). Bananas are 6 (7= 6 + 1) so, the value of each banana is 2. 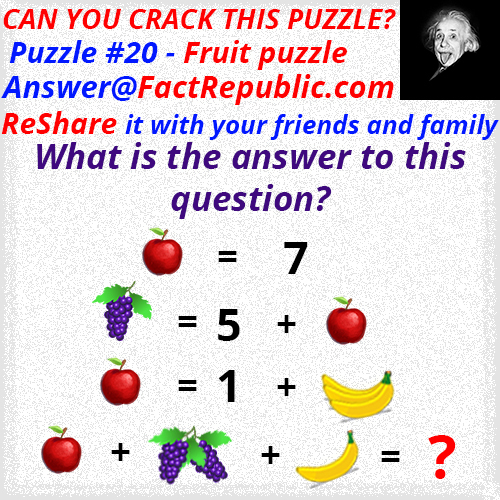 So 7 + 24(2 groups of grapes) + 2(single banana) = 33. 7 is first, 1 is second in code and 8 is third. Many think it is 1 because of one of two common errors. The first common error is failing to see that when a number is alone inside a set of parentheses, you remove the parentheses. If a number is sitting beside a set of parentheses with only a number inside them, it’s multiplication. The second common error is believing multiplication always comes before division. That isn’t true. They hold equal priority and are performed in order from left to right. This holds true for addition and subtraction and they are also performed in order left to right. With a fraction, we perform the top and then the bottom. Divide by the bottom number of 3. Congratulations if you put -7. I’m sure some won’t believe me and will say there can be two answers or that’s not how they used to teach it or this is crazy new common core method, but it’s not. Perhaps you were taught incorrectly, but the order of operations has never changed. The oldest algebra I have researched and found was printed in 1910, and it is used in it this way. Unless you went through school before 1910, this is the method that should have been taught. This question and answer was submitted by one of our facebook readers – Eric Peyton, who is a high school math teacher. So credit goes to him for this wonderful question. The value of 6 spoked wheel is 6. The value of 10 forked tree is 10. The value of 4 leaved clover is 4. So no matter what you follow PEMDAS or BODMAS, the equation should be solved in the following order: multiplication, addition, subraction. -43 + 12 (Addition & Subtraction have equal precedence in order operations and should be solved from left to right). 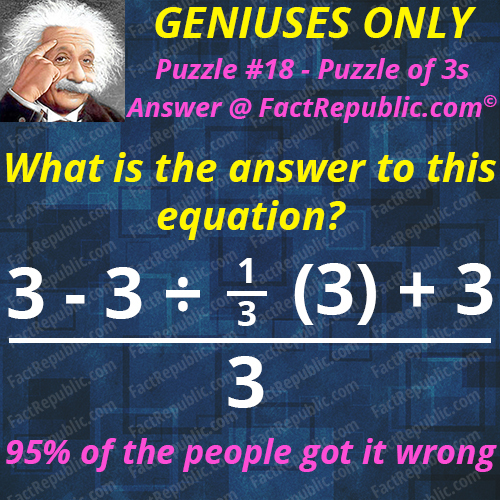 Therefore the answer is negative 31 or -31. The answer is ‘R’. It represents the gear stick. The number 1-5 represents gears and the last one thus should be reverse i.e. 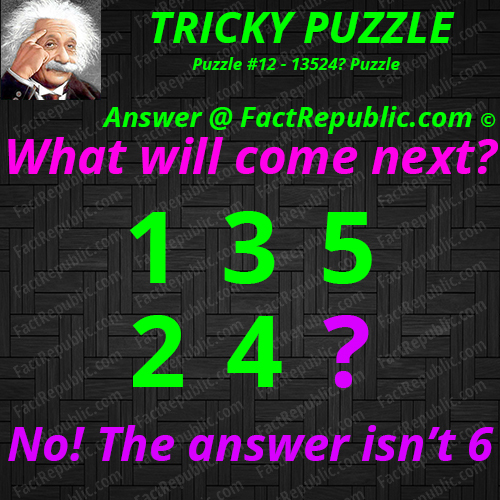 R.
Answer is 51181 (Fifty one thousand one hudred and eighty one). 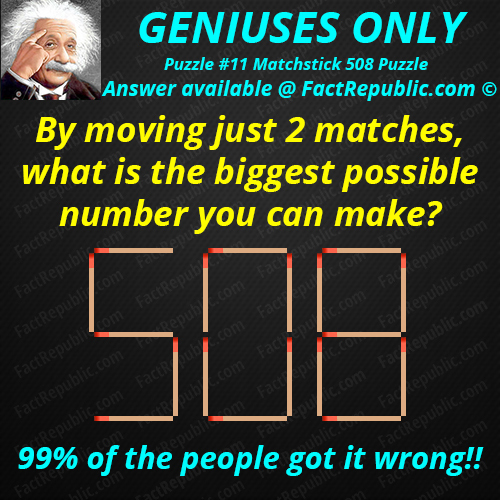 Remove top and bottom matches from the zero in 508 and create the number 1 after eight. So zero becomes 11 and the whole number becomes 51181.I am seeing people are getting really creative on our facebook post, giving really creative answers. One of them said 511811, which can be achieved by removing two matchsticks from 0 and using them to create 11 after the 8, but you would end up with two ones which look dwarfed compared to other numbers. One answer which I can really get behind is 5^118, which would end up creating an 83 digit monstrosity. Is this the right answer? It is up for the audience to decide in the comments. If you can come up with an even bigger number, let us know.